Yesterday, I had facial at Orchard and my beautician said that I've lost alot of weight and my skin is still dry on the exterior and oily inside. I told her that it's because of work stress (I just came back from incredible India [incredibly hot! ])and imbalance of hormones. I am tann now. I want to regain back my fairness. Sob sob. 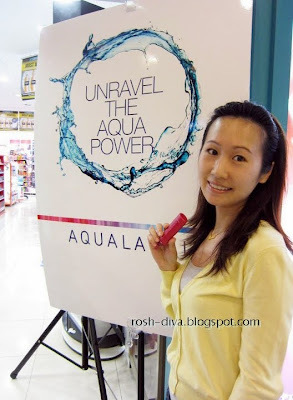 Then, I set off straight away to Ngee Ann City Watsons with my bare face and red skin (though I did draw my eyebrows) for the AquaLabel Auditions. I saw Qiyi at the AquaLabel counter. She is very friendly. She doesn't look local. I thought she is from Hong Kong or Japan :) Weird, I kept having this assumption that I have to fill up a form. Was asking around where to fill up the AquaLabel form and made everyone confused. AquaLabel is from Shiseido. I saw this range in Tokyo last year and I bought two of the Moist Essence GG. It grabbed my attention then because it's for minimising pores, which I badly needed it that time as the weather in Tokyo is dry. My already big pores seemed larger :( Then I realised that we have this in our local stores (since July this year) too but I think I got it cheaper in Japan. AQUALABEL’s four powerful ingredients: Moisture Membrane, Double Hyaluronic Acid, Biocompatible Hydrating Liquid and Aqua Synergy, help plump up the skin by infusing it with moisture, locking moisture and at the same time replenishes skin. Other than the four powerful ingredients, this moisturising range also contains Collagen Glycerin and Apricot Extract that keeps skin looking young and supply by plumping up with collagen and promoting production of natural moisturising factors. It is also fragrance-free and coloring-free. Dermatologist-tested. After toner, I apply the Moist Essence GG onto my cheeks and forehead. It is a transparent liquid essence that is easily absorbed into the skin. You can just squeeze a little out and spread it across the cheeks. There is no apparent smell other than the alcohol smell (which is quite strong) but it doesn't "burns" the skin. After a month's usage, I feel my cheek area significantly moisturised and lifted, hence resulting in the closing up of pores. The peeling I had in Tokyo was gone too then. Plus, I think the collagen provides the elasticity and lifting feeling. The 30g small tube really lasted a long time for me. I'm into my second tube recently. wow....a very nice beauty product review! i like fragrance-free and colouring-free face products! I shall give it a try someday, need hydrating products badly for my face.. it has been quite dry lately.. Thanks vialentino. This blog entry is a contest actually. Hope that I'll be selected.